This month we had Very Important Guests. I’m not at liberty to disclose their identities, but I can tell you they were travelling on the company credit card. It seemed only sensible to bring them along to Bar of the Month so that they could spend some of the money weighing so heavily on their wallets in support of vital beer-centred research. As Euro 2012 approaches we are receiving more and more visits from Very Important Guests. Major media outlets are suddenly interested in getting to know us. If we play this right, Bar of the Month could be entirely funded by external sources up until June. Wall-to-wall football will be a small price to pay. It had to be Kazimierz, and if it was Kazimierz, it had to be Plac Nowy. We hadn’t planned to take on the big daddy of bar venues quite this early in the game, but needs must when the Devil has an expense account. Where do you start in Plac Nowy? The answer, as everyone knows, is Kolory. 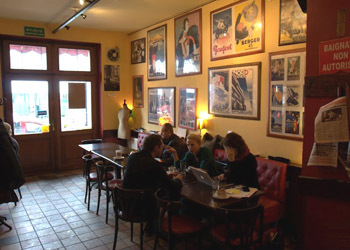 Les Couleurs Cafe, or Kolory as it is universally known, is Plac Nowy’s reception room. It’s where you meet before you go somewhere else. The ‘going somewhere else’ part of this formula is, in my view, a mistake. Everywhere we went after Kolory reminded me of the dankest and most densely packed parts of Camden Town circa 1994. The problem is that, if you’re old enough to remember Camden Town in 1994, you’re unlikely to enjoy a similar experience at your current great age. If you are currently young, hip and/or spunky, go anywhere on Plac Nowy – you won’t notice the difference (though I’m pressed to mention that Singer is for the hippest and spunkiest of them all). If you look back on spunkiness with a glow of nostalgia, go to Kolory and stay there. The bar is a thing of spacious beauty that demands extended perching. Arranging to do this in the company of Very Important Guests is desirable, but not at all necessary.